As the weather warms up, many of us will take advantage of the fresh spring air by opening windows and doors around the home. However, an open door or window can also pose a security risk and make your property more vulnerable to thieves. Spring is also a time when we start sprucing up the home, making this the ideal time to conduct a home security check. We recommend conducting security checks regularly to help reduce the risk of a break-in. Following is our five step guide to help you make your home more secure. Put yourself into the mindset of a burglar to see if you can break into your own home. Start by walking from front to back of the property and around the perimeter of your home, actively identifying any security gaps. It’s a good idea that two people audit your home during the day and night to ensure nothing is missed. Don’t forget to check the garage, shed and laundry doors and windows as these areas can be often overlooked. This is also a good time to check how secure the latches are on windows and doors; you might find a lock you didn’t even know was broken. Trim any hedges or shrubs around your fence and under windows and verandas. These can potentially provide a perfect hiding spot for thieves to duck behind if a sensor is set off or the dog starts barking. If there’s no place for burglars to hide, chances are they’ll hit the road. For those in double storey homes, check for overhanging tree branches, external walls or drain pipes that could provide access to the upper level of your home. Also, ensure that tools, ladders and wheelie bins are put away to prevent intruders from using them to access the home. Add motion-detecting floodlights around the garage and all entrance points to your home. It’s important to mount them high enough to prevent intruders from disabling them. This tip is an oldie but a goodie when it comes to security technology and an easy, affordable addition to any home to help deter intruders. 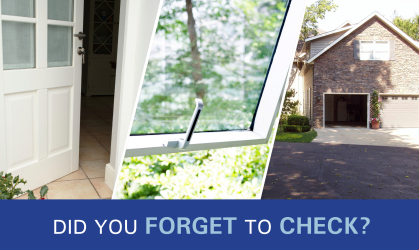 Consider upgrading your security screens on windows and doors as creepy crawlies aren’t the only intruders you need to keep out as the weather warms up. Burglars can take advantage of any security gaps so consider replacing new screens with a stronger layer of mesh. Safety chains on solid doors can also be easily broken, making a security screen door a valuable addition. They can also provide greater visibility so you can identify whoever is outside. Call the security experts at ADT to assist with your home security audit. Schedule a free consultation and one of our licensed processionals will visit to your home and advise a security solution to suit your lifestyle over the warmer months. From motion detection, back to base monitoring and 24/7 surveillance cameras, a professional home security system will not only help keep your home and family safe, but could also be more affordable than you might think. For more security tips, visit the resources page on our website www.adtsecurity.com.au.